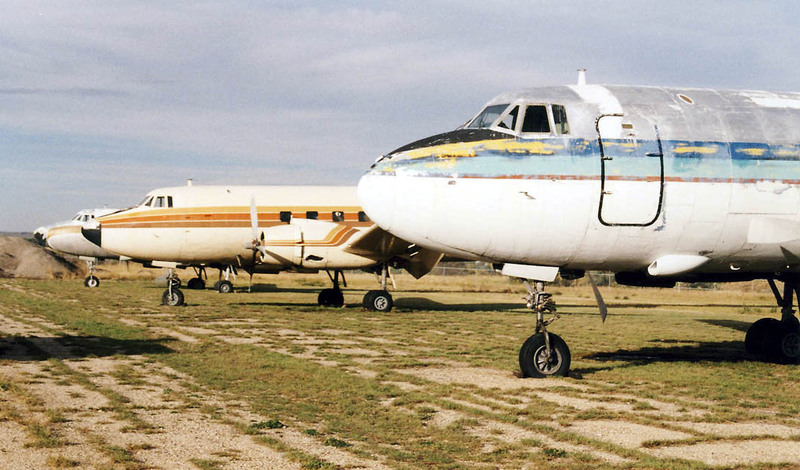 Martin 404s in storage at Sheridan, Wyoming, USA, in 1997. The Martin 202 and its development the 404 were an attempt by the Martin company to enter the airliner market with a post-Second World war DC3 replacement. Martin got its contender, the 202, into the air on November 22, 1946, ahead of its main rival, the Convair 240, and it sfuture looked rosy when Northwest Airlines started the first service in November 1947. The 202 was a more basic aircraft than the 240, able to carry 52 passengers over longer distances but without pressurisation. But its prospects were to be all but destroyed when it was discovered the cause of a fatal crash was a serious structural problem in the wings. All the 202s were withdrawn amd modified, re-emerging as 202As. TWA operated the first service with this type in September 1950 but the balance of power had switched to Convair and was to stay with that company. Martin flew its next development, the single 303, in June 1947 but results of testing after the crash led to the 404, a pressurised airliner with a slighter longer fuselage. The first 404 flew on October 21, 1950, and early customers included Eastern Airlines, with 40, and TWA with 61. Eastern began operations with the 404 in October 1951 and kept them for ten years before passing them on to second string operators. Several aircraft are potentially airworthy with historical operators in the USA, but none are currently active.